Home to the iconic Panda, China's Sichuan province is home to revered cuisine and treasured regional culture. But go deeper into this ancient land, and you'll find legends of sacred mountains and rivers, interwoven with the ancient lore of China's cultivation culture. Let these secrets come to light as you cycle through wild countryside and get a feel for the real Sichuan. This action-packed tour of Chengdu starts off with the first highlight - the Dujiangyan Panda Valley. The famous Panda centre offers refuge and doting for these magnificent, rare animals with rearing and breeding programmes. These giant pandas are the symbol of China, and the research centre provides education and raises awareness of the plight of these great creatures and their environment. Our tour then moves on to discover the history of two ancient towns. Then it’s on to Mengding Mountain, famous for its tea culture where we take a walk in the Mengdingshan Royal Tea Gardens: a delight with its atmospheric pavilions and walking paths. China’s tea growing history can be traced back to the Western Han Dynasty over 2,000 years ago. Reputed to be the birthplace of Chinese tea cultivation, tea trees planted at Mengding by a herdsman are believed to be the very beginning of China's tea history. We next visit UNESCO Heritage listed Mount Emei, one of the Four Sacred Buddhist Mountains of China and traditionally regarded as a place of enlightenment. The unsurpassed views are one of the great spectacles of Mount Emei and is yet another high point of the tour in all senses of the word! The ride then follows the river to the town of many temples, Leshan. Our last day of the tour takes us on a walk through bamboo forests and to Huang Long Xi, a picturesque town where many Chinese movies have been filmed. We meet in Chengdu for a trip briefing and bike fitting. The afternoon is free to explore the city until the welcome dinner. We transfer to the new Dujiangyan Panda Valley where we spend a few hours meeting the lovable pandas. Our bikes will be waiting for us to ride when we finish our visit. We cycle from the valley to Jiezi Old Town then on to Anren Ancient Town. We head for the hills as we begin our climb up into tea country. We stop at a tea factory and learn about the process before having lunch in Mingshan town. In the afternoon, we continue climbing up to Mengdingshan Mountain, the birthplace of Chinese tea culture. We then get off our saddles and spend 1-2 hours walking on peaceful trails. We start easily, zooming down the hill to Mingshan and heading south to the village of Caoyuthan. Here we cross a river and continue riding along a riverside road. We cycle through a tall gorge and scenic sites. After lunch, we ride to the back of Mt. Emei, the highest of four sacred Buddhist mountains in China. We rise early to explore Mt. Emei, making our way to the mountain's top and many temples and shrines. We then head down to the park's main entrance, walking part of the way to visit temples tucked away in the forest. In the afternoon, we ride to Leshan and take a short boat ride to the world's largest seated Buddha, built during the Tang Dynasty and carved out of a cliff face. We ride up north along the Min River, stopping for a walk through a secluded network of paths in a peaceful bamboo groves. After lunch we arrive Meishan town to continue to our final destination in Huanglongxi, a quaint town with classic Chinese architecture where many famous Chinese movies have been filmed. We transfer directly to the airport in time for your departure flight. Or, if you are extending your stay in Chengdu, we can drop you off at a city hotel. Day 2 - Chengdu - Anren Ride 69km. +282m / -246m. Wonderful experience in cycling, hiking and tasting everything the Sichuan area of China has to offer. Ride support is top notch. China was so much better than I expected. Clean with good roads and friendly people. The food was excellent. We had great support from SpiceRoads. Our China bicycle trip was wonderful. From the panda sanctuary the first day, to food and lodging, the trip was enlightening. Our guide, Ying-Ying, was so knowledgeable and so welcoming to our questions. We start the tour in Chengdu and from here we visit the first tour highlight, the Dujiangyan Panda Valley. This new centre offers refuge for these magnificent, rare animals with rearing and breeding programmes. These giant pandas are the symbol of China, and the research centre provides education and raises awareness of the plight of these great creatures and their environment. Our tour then moves on to discover the two ancient towns. Then it’s on to Mengding Mountain, famous for its tea culture where we take a walk in the Mengdingshan Royal Tea Gardens: a delight with its atmospheric pavilions and walking paths. China’s tea growing history can be traced back to the Western Han Dynasty over 2,000 years ago. Reputed to be the birthplace of Chinese tea cultivation, tea trees planted at Mengding by a herdsman were believed to be the very beginning of China's tea history. 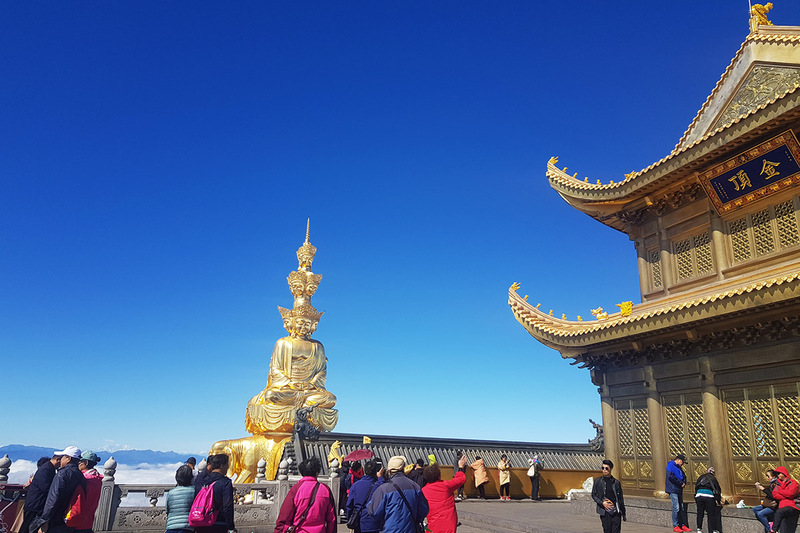 We next visit UNESCO Heritage listed Mount Emei, one of China's Four Sacred Buddhist Mountains and traditionally regarded as a place of enlightenment. The unsurpassed views are one of the great spectacles of Mount Emei and is yet another high point of the tour in every sense of the word! The ride then follows the river to the town of many temples, Leshan. Our last day takes us on a walk through bamboo forests and to Huang Long Xi, a picturesque town where many Chinese movies have been filmed. Suitability: There are climbs and downhill runs, but they are all on paved roads so a smooth steady effort is possible. Being physically fit will of course be a huge asset. This tour is partially supported in that a vehicle will follow but will only have room for a few cyclists at a time. Biking Conditions: This bike tour is all on smooth, paved roads. There are some climbs, and these could be a challenge for those without a moderate level of cycling experience and a basic level of good physical condition. On arrival in Chengdu and after checking into the hotel, we meet our guide and the rest of the group for a briefing and to fit our bikes. Chengdu has the reputation as a very "laid-back" city that emphasizes culture and relaxation and is a great introduction to this fascinating country. In the evening we have dinner together and a chance to try the traditional Sichuan hot pot, a popular spicy dish. After breakfast, drive out of the city center to spend the morning with pandas. We transfer to the new Dujiangyan Panda Valley where we spend a few hours meeting the lovable pandas. Our bikes will be waiting for us to ride when we finish our visit. We cycle 20 km from the valley to Jiezi Old Town, along the foot of Mount Qingcheng. Jiezi has a history of over 1,000 years and boasts 32 temples and a number of historical sites, but it is also a bit touristy, so we won't linger too long. After our stop we ride on to Anren Ancient Town, through countryside, and in late February and March, when the canola flowers bloom, the farmland scenery is truly spectacular. The terrain is primarily flat and will be easy riding. In the afternoon we will cycle to the historic town of Anren which is famed for having 27 mansions built during the period of the Republic of China. Today we leave the flats behind and head for the hills as we begin our climb up into tea country. We stop to visit White Horse Spring which was constructed during the Tang Dynasty and named because clops can be heard when the water ebbs and flow. From there it's a short downhill to Shangli Ancient Town, famous for their noodles which we will have for lunch. From here we transfer up to perhaps the most famous tea garden in China. Via gondola we are taken to the top of the Mengdingshan Royal Tea Gardens, home to the world’s oldest living tea trees and where China's finest green tea was grown to serve royalty. We will spend an hour walking on trails and there are great views if the weather cooperates. We transfer to our hotel in the town of Ya'an. A short transfer to our ride start. Today we cycle through rolling hills and farmland to the village of Caoyuthan. Here we cross a river by a small dam and continue along a quiet, little country road following the river. After lunch we ride to the backside of Mt. Emei, the highest of four sacred Buddhist mountains in China. At around 63 km the climbing starts and we will hop into the van to reach our hotel in the village of Linggongli, in the shadow of this majestic mountain. We have an early start to spend the day exploring Mt. Emei. Cyclists are not allowed on park roads so we take a 40 minute bus ride to where we catch a cable car to the top of the mountain at 3077 m/10,168 ft. We spend an hour at the summit touring the many temples and shrines on this most holy peak. The views are weather dependent, but if it is clear we won’t be disappointed. We take the cable car and bus down again, but this time all the way to the base of the mountain. After lunch our bikes are ready and waiting for us and in the afternoon we continue our ride to Leshan, located at the confluence of the Dadu and Min Rivers. If time allows, we take a short boat ride to see the world's largest seated Buddha, a 71 metres (233 ft) tall stone statue, built during the Tang Dynasty, carved out of a cliff face. We spend the night here in Leshan. Today we ride north and upstream roughly following the Min River for the entire day. It is a very pretty road as we pass through orchards and rice fields. The first leg will be 27 km to the temple of Qingshanzongyan where we take a break and go for a walk through a secluded network of paths in a peaceful bamboo mountain forest. Along the way there are some ancient bas-reliefs cut into the shale cliffs, and some small shrines. Our lunch stop is at a local riverside restaurant. When we reach the town of Meishan we'll decide if we want to continue riding along the river or transfer to our final destination of Huanglongxi. This quaint town with classic Chinese architecture has been restored and preserved and more than 180 Chinese movies have been filmed here. The village sees a lot of day visitors, but few people spend the night here and we have the ancient alleys to ourselves to explore. As it’s the last night of the tour we enjoy a farewell dinner together. We transfer directly to the airport (which is conveniently part way between Huanglongxi and Chengdu) in time for your onward flight. Or if you are extending your stay in Chengdu we can drop you at a city hotel. Because some people can't imagine going on a trip without their own beloved bicycle, we do not provide them as part of this tour. However, you are able to hire bikes locally for the price listed in the tour pricing section. The bikes are mountain bikes (Giant ATX 650/770, 24/27- speed Alivio, front shocks, vee and disc brakes). If you bring your own bike, please make sure it is a mountain bike, preferably with front suspension, and that it is in good mechanical order. All nationalities are required to possess a valid passport. An entry visa is required to enter the PRC. Most travelers will seek a type L visa, stemming from the Chinese word: luxing (travel). This letter is stamped directly onto the visa. Visas are easily obtainable from most Chinese embassies or consulates abroad and issued within 3 to 5 days from application. Express visas are available for an additional fee. If you are applying for a visa by mail, it can take 3 to 4 weeks for approval. Most nationalities qualify for a 30 day visa which is activated on your first day in China, and must be used within 3 months of its issuance. There are also 60 and 90 day visas available. The 90 day visas where once difficult to get but are now more easily obtainable. A Chinese visa covers virtually the entire country with the exception of some restricted areas and Tibet. Recommended vaccinations include: Adult diphtheria and tetanus, Hepatitis A and B, Measles, mumps and rubella, Typhoid, Varicella, Influenza, Japanese B encephalitis, Pneumonia, Rabies, and Tuberculosis. If you are arriving from a country infected with Yellow Fever, a certificate is required within six days. Please speak to your doctor for the most up to date information. China is a big country with a massive land and the climates is extremely diverse that varies from region to region. The climate of China at the north is mostly subtropical during summer and very cold in winter. Only a few months have an intense raining and often cause flooding at the central and southern part of China. The overall temperature can range from 6°C to 31°C which in some parts of China is freezing as low as -4°C and some region with high temperature that can rise up to 35°C. Therefore it is hard to summarize the climate in general but it is possible to divide into different regions where we tour. Chengdu, Sichuan This area has a subtropical monsoon climate. It is fairly warm in the winter, dry in the spring, hot in the summer, and rainy in the autumn. The average temperature in January is 5-8 degrees Celsius (41-46 degree Fahrenheit). The average temperature in July is 25-29 degrees Celsius (77-84 degrees Fahrenheit). There are 250 to 300 cloudy and rainy days a year in the plain. The rainy season extends from May through September, and the dry season extends from October through April. The Western Sichuan plateau areas are quite cool and have an average annual temperature of less than 8 degrees Celsius. The climate can be summarized as a late spring, a short summer, a short autumn and a cold winter. The average temperature is 5 degrees below zero in January, 5 to 10 degrees in April, 10 to 15 degrees in June and 5 degrees in October. Spring is from May to June when normally the snow will melt up on the mountain tops. July and August are the rainy season, with the average temperature range from 20 °C (65 °F) and 28 °C (83 °F) during daytime. Autumn comes in early September and winter can come by November. Weather in Yunnan is considered the warmest part of China compared to other regions where we cycle from Kunming to Shangri-La in this region. An average daily high temperature is only 24°C. The climate is almost moderate but there is still some months with high humidity. Hot season temperature's range is only 22°C to 25°C from March to September, making May and June the hottest. Cold season occurs for the whole year with temperature ranging from only 3°C to highest at only 17°C making January and December the freezing month. Rainy season starts in May and ends in October with an intense raining for June, July and August. Meals are included as per the itinerary where B = breakfast, L = lunch, D = dinner. Most meals are some variety of traditional Chinese dishes. The staple of any meal in China is either rice or noodles, and most meals will include these. Chinese cuisine is world famous and we make sure our meals allow you to sample as much variety as possible including local specilaties. Any special dietary requirements can also be catered for as well. Please let us know at the time of booking. Keeping you completely hydrated is a job we take very seriously. Cold water, some energy-restoring local fruit and soft drinks are included in the tour price. Beer is freely available everywhere in China, but is NOT included in the price. We recommend that you tuck away a few extra dollars, perhaps US$10, for incidentals. Renminbi can be exchanged for foreign currency or travelers checks at border crossings, international airports, branches of the Bank of China, tourist hotels and some large department stores. The official rate is given almost everywhere and the exchange charge is standardized, so there is little need to shop around for the best deal. ATMs are common in all sizable towns and cities and you can use Visa, Master Card, Cirrus, Maestro, Plus and American Express (AmEx) to withdraw cash but there is a maximum daily withdrawal amount.